Thursday, November 21st marks the Third Annual Clementime Microhood . We love the community and feel of the Inner Richmond neighborhood and can’t wait to return! 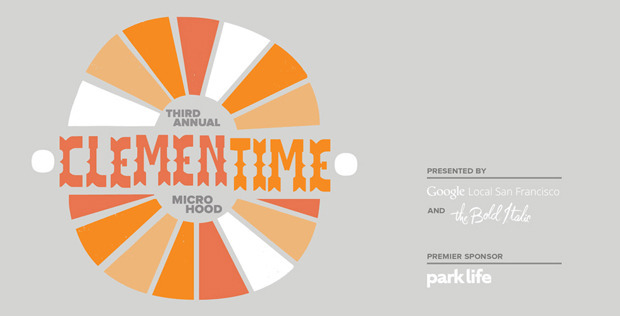 The Bold Italic and Google Local, in partnership with Park Life, are excited to bring you an evening of fun on Clement Street between 3rd and 7th Avenues. Park Life offers refreshments in the form of drinks and snacks. They are also raffling off an original art piece by a Park Life artist. Free raffle ticket with purchase. Green Apple Books keeps you entertained with music from RonDre and plenty of beer. They are taking 10% off everything and are hosting Docs of The Bay outside their shop for burger goodness. Seedstore serves white wine throughout the evening while an acoustic musician plays in the shop. Pretty Please Bakeshop sweetens the event and takes 25% off all bakery items and 10% off all holiday orders placed during the night. They’ll also hook you up with spiked (or regular) eggnog. Foggy Notion celebrates their two year anniversary with complimentary drinks and snacks. Dirty Trix Saloon keeps you full with complimentary meatball sliders and $1 off cocktails. Kisha Studio gives out champagne and fruits plus 10% off the store for the evening. Q Restaurant and Bar reduces bills by 10% with a mention of The Bold Italic. Kumquat Art takes $10 off purchases of at least $30 that are in stock and full priced with an email address. Toy Boat Cafe scoops out $1 cones of Chocolate Salted Caramel Brownie from 6:30-7:30 P.M. The Mysterious Rack hooks you up with 25% off the whole store.